I'm in for Blue Boxed Edition. CIB Blue since the Reds are gone. Hi i just wanted to ask any new updates on the release of (HUNGER SHARK?) and are payments being taken soon, i would like to know thanks. The manual is being completed now and just waiting on the OK from Albert to have the cartridges put together. I would like a blue boxed edition. Looks great! I'd like a blue box as well. Looks fun! Hi i just wanted to ask is this game coming out soon. The boxes are in the mail to me from Marc. Just waiting on the final revision on the manual and an OK on the latest build of the BIN. 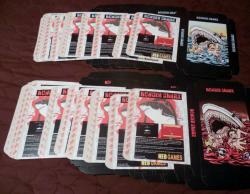 Once that happens I will start taking payments and the game will ship 7-10 days later. There can always be delays in the home stretch of a release that are unforeseen. This is why I quit taking pre-payments until I know everything is in final production. Some people, understandably, get worried when they have paid and then the game starts getting delayed. I work with the best people available to release these games and if they see a problem it gets corrected before things continue. I just want to make sure that the final product is the highest quality attainable. 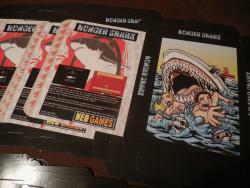 Don't worry, HUNGER SHARK is almost ready to go. Thanks. 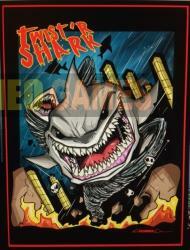 The art work is by a friend of mine, Michael Duron aka LocoDuck. 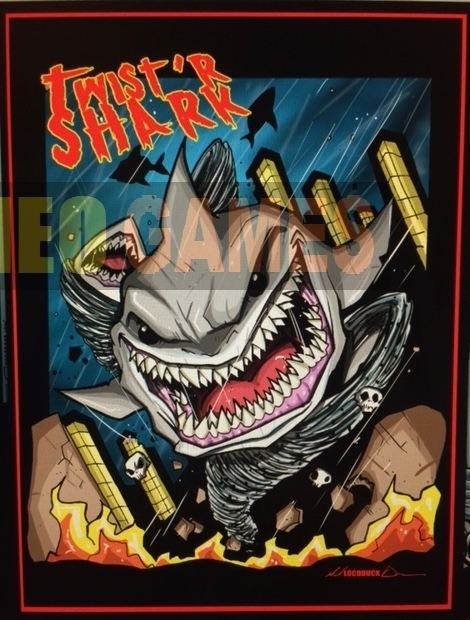 He is also doing the label art for the re-branded SHARKNADO game TWIST'-SHARK. This is the original art before it was scanned into a digital file. Just putting in a second request to get on the blue boxed list. I think my last post from two or three weeks back was overlooked when the reservation list has been updated, so I wanna make sure I'm on the list! Sorry about that. I have you reserved for a Normal (Blue) Boxed Edition. 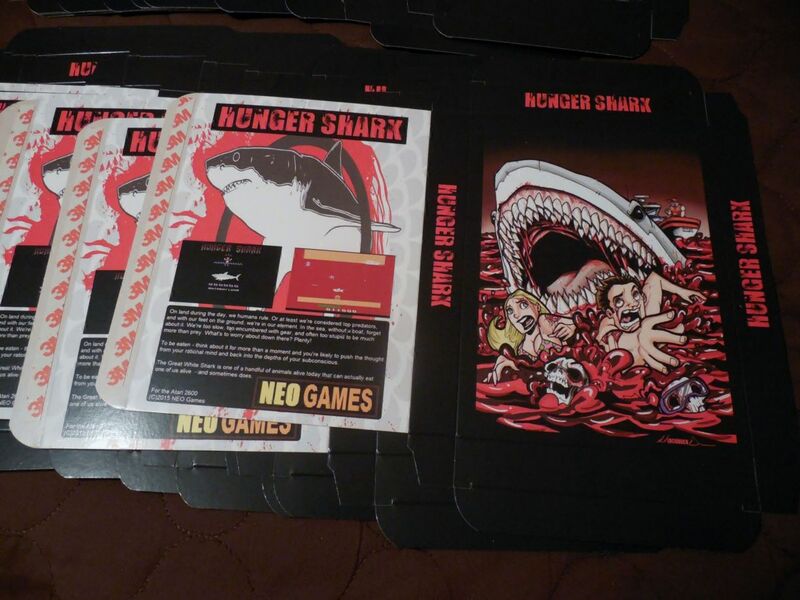 I just received the HUNGER SHARK boxes and everything looks great!! I also got an O.K. on the final BIN on real hardware. The manual should be ready in a day or so. As soon as I get an update I will start taking payments. 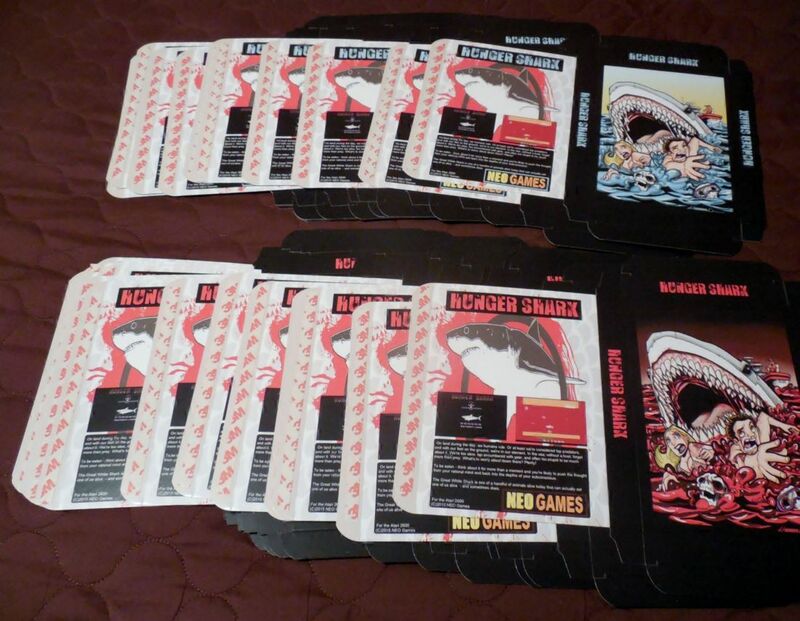 All 50 of the HUNGER SHARK boxes. Unfolded. Anybody want to help folding them?? Cartridges are being produced and I am just waiting on that to finish before taking payments. Hopefully by the end of next week. There are still some copies of the Normal (Blue) Boxed and the Cartridge and manual only versions. Once payments are being accepted the reserve is over and the prices go up $5 each. You can put me down for a blue boxed! You got it. List updated. I'll take a blue boxed version please. If a red opens up for some reason I'll take one of those too. I'll take a NORMAL Boxed Edition (BLUE) please! If anyone on the Red drops out, please switch mine over to red.